Purdue Science K-12 Outreach has partnered with five different school districts on six mathematics and science partnerships. These partnerships were funded through the Indiana Department of Education Title II, part B Mathematics and Science Partnership Program. The two year partnership with Lafayette Jefferson High School and Central Catholic will work on the use of one to one technology in the classroom. Teachers felt they needed help with using the technology more effectively and in a way that makes the use of computers seamless in the classroom instruction. Teachers will work to utilize technology in more ways than searching the internet and paperless homework. Teachers will also integrate technology resources throughout the instructional process and educational experience for students. CTU 4 ISE is a three-year $246,000 partnership between Jefferson High School in Lafayette School Corporation, Purdue University College of Science, Purdue University College of Education, Purdue University College of Engineering, and Science Express. The partnership goal is to develop and implement content themed Interdisciplinary STEM Education curricular units aligned with national and Indiana STEM education standards. Program activities include: a summer institute for teachers, school-year workshops, and participation in professional conferences. Science through Inquiry: The Next Steps was a three-year $877,000 partnership between the MSD of Decatur Township, Purdue Science K-12 Outreach, and the Challenger Learning Center of Decatur Township. This partnership created a comprehensive professional development program to improve the quality of science instruction with an emphasis on inquiry-based pedagogy. Program activities included: a summer Inquiry Science Institute, curriculum mapping, monthly workshops, and participation in professional conferences. The program focused on student-centered lessons aligned with standards-based structures. Using Science as the Bonding Agent to Inquiry and Global Awareness was three-year $335,000 program between MSD Washington Township Schools, the Purdue University Department of Biology, the Purdue University Department of Curriculum and Instruction, and Purdue Science K-12 Outreach. Goals for the partnership were built around increasing teacher content knowledge of science in order to improve the science readiness of MSD Washington Township students. Partnership activities included using research-based science curricular modules, developing science and literacy connections through science notebooks and vocabulary strategies, and developing International Bachelorette Primary Years Program inquiry unit lessons. MS-RAPs was a three-year $499,000 collaboration between Community Schools of Frankfort, Shelbyville Central Schools, Purdue College of Education, and Purdue Science K-12 Outreach. 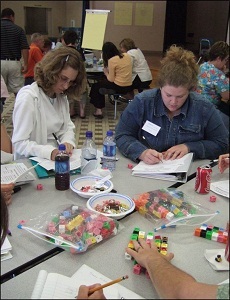 Science K-12 Outreach coordinators worked with K-8 teachers to improve the quality of mathematics and science instruction and to develop mathematical and scientific literacy in all students. The partnership included two weeks of summer training for teachers, a week of science camp for K-7 students, regular visits with each teacher and workshops throughout the school year. Each participating teacher implemented of a series of inquiry-based lessons during the school year. PIBS3 was a three-year $389,000 project between MSD Washington Township Schools, the Center for Research and Engagement in Science and Mathematics Education (CRESME), and Purdue Science K-12 Outreach. K-8 teachers of science from all of the district elementary and middle schools worked to improve the quality of science instruction and to develop scientific literacy in all students. The partnership included two weeks of summer training for teachers, a week of science camp for K-7 students, regular visits with each teacher and workshops throughout the school-year. Each participating teacher implemented a series of inquiry-based lessons during the school year. The Improving Inquiry and Standards-Based Elementary Science Instruction partnership was a three-year $300,000 project between Community Schools of Frankfort and Purdue Science K-12 Outreach. Goals for the partnership were to improve the quality of science education provided by elementary teachers and to develop scientific literacy in all students. The partnership included two weeks of summer training for teachers, a week of science camp for K-5 students, regular visits to each elementary school and workshops throughout the school year. Each participating teacher implemented a series of inquiry-based lessons.